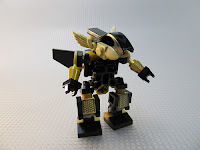 Multihawk isn't really a member of the Mecha / MFZ community but, seeing as he's going away to college and into a self-imposed Dark Ages, I figured I'd give him a send-off with a Spotlight post. He's got some great microscale builds. Moving from newest to oldest, let's take a trip through his Flickr stream. Tempest Assault Speeder. Offsets and angles and colors, oh my! Utility Vehicles. Sometimes you need some scenery to fill up the battlefield. These feature a great use of color. Nanoscale Forces. Marshaling for battle. 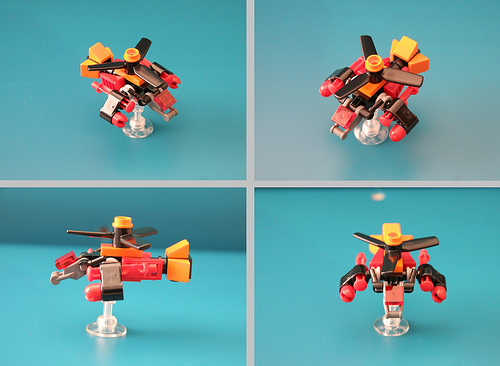 A great use of parts and a very subtle use of color. Dynamic Punkfighter. Another great use of color. ISO-MEC. This would make a great powersuit. Put a bunch of them together on a base. DA-77 Dominator War Walker. NPU on that turret piece. The whole build has a great look. 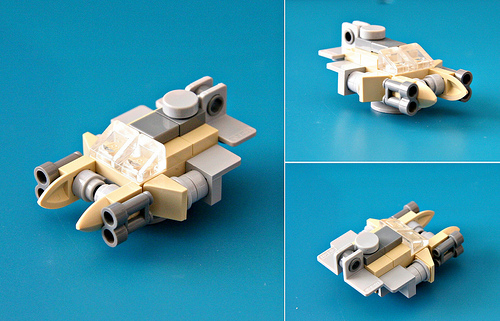 Microspace Vehicles, Reloaded. A great combination of parts and color blocking. Last year I posted a challenge to the community called the Single Set Challenge. It involves using only the pieces from one set to build a frame -- or frames. I've tried it twice. The first was the SpAAT which I made from two sets and a handful of my own parts. The second, and closest I've come, is the Bullfrog which needed one single outside piece. Recently two builders have stepped up to the Challenge. Both have succeeded, but in wildly different ways. The first is Gusindor. He came at the SSC from a mostly normal direction. He just went bigger than I stipulated in the "rules". 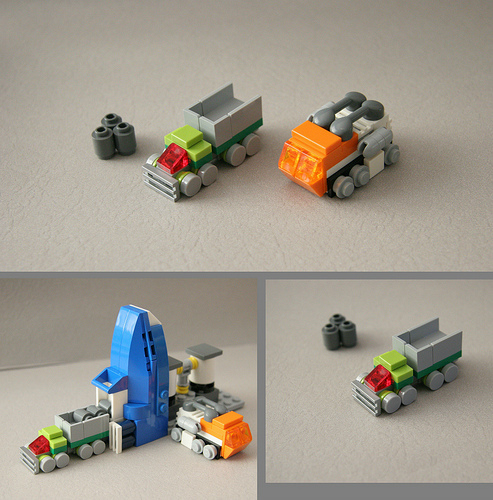 The Rusty Rovers uses set 31005 to create five frames and three stations. That's enough to play a game right off the bat. The second is darksyntax. He was inspired by a question on G+ about using a basic brick set to build enough frames for a few players. MFZ-6177 is the answer to that question. He even takes the time to give you a breakdown of the parts count and how they're used. I was on a bit of a building streak last week and came up with a new MFZ squad. I call them the "Cube Crew". All of the designs are based around this, the die from the Lego games line. Here's the Flickr page. Of course I updated this one right after I took pictures so this picture is a little out of date. I wanted to build one in blue, but I could quite envisage what exactly I wanted it to look like. 31009 Small Cottage. $19.97 for 221 pieces. That's $0.07 per piece. With plenty of basic bricks in Light Bley and Red you should be able to put this to good use making terrain. It also has a small amount of useful parts for mech building. 31010 Treehouse. $29.97 for 356 pieces. That's $0.08 per piece. And not only do you get a handful of useful mech parts -- plate clips, tile clips, battle droid, arms, etc. -- you get almost 40 1x2 White and Brown bricks. Along with some other bricks in the set this should allow you to build some walls or a decent building for use as terrain. 31012 Family House. $69.97 for 756 pieces. That's $0.09 per piece. Like 31010 it has a handful of fiddly bits. It also has basic bricks in Light & Dark Bley and White in enough quantity to be useful for terrain. It also has a light brick and it's still affordable which is a miracle. The only thing these three sets have that I don't really like is minifigs, which aren't all that handy when it comes to building mecha. Otherwise they are all excellent deals. Yes, I bought more of them. Having access to package codes makes it a lot easier to grab the ones I think are interesting. These are from Collection #2. Which is actually the third release. The claw is neat, as is the helmet right above it. The gun and the head too. And, hey, are those Brickarms bipod copies? Puuuurple. :-) The translucent staff is cool as are the two tubular pieces to the left of it. One again the head and the helmet look good. I've already used those wheels in my Heretic build. That 2x2 Trans-Cheese Slope could make for an interesting cockpit piece. The gun has already been used in a build -- color coded too! That 1x1 Plate w/Bar (Closed Ends) should come in handy too. I really like that 1x2 Plate w/Bars (Offset) and the clip on rockets The Minifig Neck Clip Wings might be a bit of a challenge to use, but will probably look spectacular. This will give you some idea how big these Micro-Transformers really are. They should make for good pieces in a "4P" scale game. This yields a score of -5 or B-. I've spent more time sorting and building this weekend than I have writing, so this'll be a quick post. The Stick Figure frame started out looking like this. Which I then modified a little in the feet and added a helmet. Finally, with the addition of a few Attachments, it was finished. Mobile Frame Hangar discussion topic. Oh, here's a picture comparing it to the Chub. 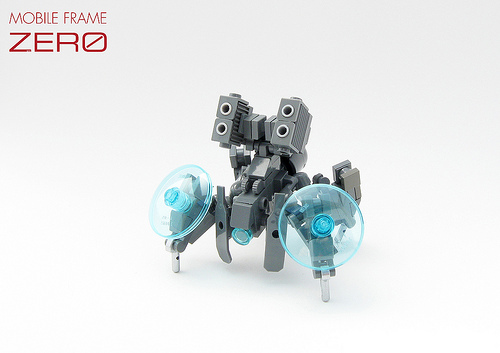 There's a bit of cognitive dissonance when switching from Mechaton to Mobile Frame Zero. Especially when it comes to the size of the models in relationship to the size of things that can be considered cover. Let's take a look at the height difference between the Classic and the Chub. As you can see there is some difference. Let's look at how that relates to cover. Here we see a Chub and a Classic behind the standard three brick high wall. This is the basic type of cover most people use when playing MFZ. It's easy to build and place on a playing surface. As you can tell there is a marked difference between what you can see of the Classic and what you can see of the Chub. So, why no change in the minimum size of Cover? Because of what hasn't changed. People in MFZ and Mechaton are both considered to be seven plates tall. This is usually represented with two bricks and a plate -- or tile. Sometimes even a microfig. And you can see that a person would hide quite well behind a standard wall. Let's see how they compare to frames. You can really see the difference between the two mecha now that we've added more reference points. I'm still trying to figure out what this all means, if anything at all. It is interesting, no? A little something to ponder for the weekend. It seems lately that some people are confused about why I recommend certain Lego sets as being "good for parts" and not others. And, to be honest, I was a little annoyed by these questions. After thinking for most of the day I realized that not everyone sees things the way I do and I've been involved in this hobby for a number of years while others are new to it. So, on to the questions. 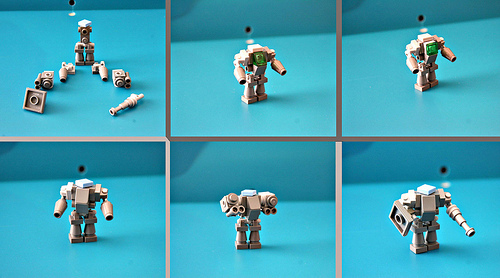 These are all the fun pieces that we use to build mechs. "There's really no note about which of those are really best." This is subjective. The one that is best has the parts you need right at that moment. "How many Mech you can really make from it.﻿", "How many mechs can I build if I buy just one set?" This is also subjective. What's your skill level? What are you trying to build? What scale are you building in? Different designs take different amounts of parts. If you want to build a more complex design it's going to take more parts. "How many different sets will it take to build one of the mechs in the book?" I don't know. I haven't done the research. 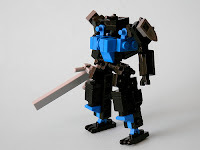 If you're looking to build mechs from the book why not try the Garage Kit? It was designed to create five mechs from one of the factions in the game. "What parts will I be missing?" You wrote "Where do I actually buy these?" Toys'R'Us, Target, Walmart, Barnes & Noble, 5 Below, etc. are all stores in my area that carry Lego. It depends where you live and what the retail presence in your area is like. "The link sends me to bricklink but there's no option to actually buy these things?" The link to Bricklink is there so you can look at the inventory of the set and decide for yourself if it's worth buying. If you click on the Set number on the inventory page it will bring you to another page where you can then navigate to "lots for sale". "I went to the nearest toy store I could find and when I asked for the first list linked they didn't have anyof the sets. The woman behind the counter said that they'd all been discontinued." The list was started a year before the blog even existed. I've been posting for a year and a half. Lego releases new sets and discontinues old ones every six months. Which means that we've gone through at least five inventory cycles since this list was started. So, yes, those first sets are discontinued. I'll try and update the list to make it a little clearer. "I'm getting really frustrated with people just tossing me links without any actual explanation about why these sets are good." "There's a local Lego store not that far from my place. Am I better off just going there and rummaging through the pick-a-brick section?" You can try, but in general the Pick-A-Brick wall is aimed more at kids than the adult builder. You will be able to pick up a lot of bricks for terrain and cover though. I hope these answers help people understand my GSfP posts. Back here I said I was looking for a way to use this piece. I found it. 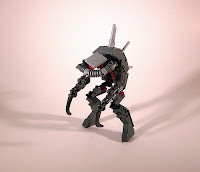 There's not much articulation beyond the hip and ankle but, I think that won't matter when attached to the right build. Another set of funky non-human mecha. 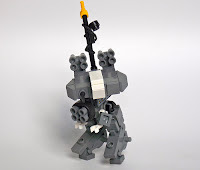 Spotter Mech by Snow Leopard. This one is part of a set. The "mothership" could make for a rather interesting piece of terrain. How did I miss this?!? Another one that's part of a team. Fantastic. Mk.46 R23 Raptor III by Ravager. A chicken walker with an interesting upper torso. 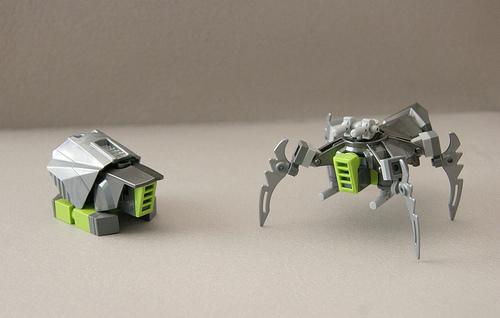 Beetle and Crawler by Multihawk. Here's a two-fer. Very nice use of the Bionicle/Hero Factory chrome pieces. This is about tagging your photos. I noticed today that one Flickr group has a number of tags dominated by our particular game, but they're not quite exact. If we all use a set of standardized tags it will bring more notice to all of our photos. 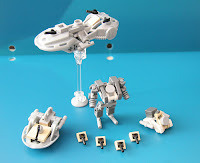 These are the Tags I use; MOC, Mechaton, Mecha, Mobile Frame Zero, Microscale, MFZ, MF0, Mech, and Kre-O, Lego, or Brickblend where appropriate. I also use Station for photos of stations. You should be able to cut and paste these straight into Flickr or whatever picture hosting service you use. Feel free to suggest more tags we should use. There's also some discussion of this on the Hangar. 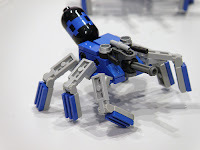 Microbricks has some neat stuff that may be of use in MFZ games. That and he's posted some really cool builds. 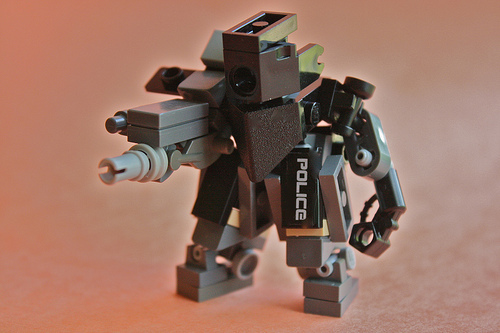 Here's a few more mecha I found by looking through Flickr. RIPPER Prototype by Ryan Kessler. Kinda reminds me of a Predator. Great personality in a small package. An excellent use of color, and the parts use for the main torso is very cool. Combat Bot by Jǝns. Kinda old school and blocky. Another case of not allowing downloads.